I normally paint very small, but over the past couple of weekends I've been helping my young friend paint 8 twenty-foot long wooden posts which make up the new pergola in her garden. We finally finished yesterday - apart from a bit of touching up here and there. 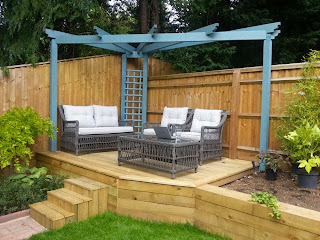 Also the furniture arrived for the newly made sun deck. All we need now is a hand rail on the other side of the steps so I don't fall down, and for the blue painted trellis at the back to be neatly fixed between the uprights. Neither of us are expert gardeners so we've been scouring gardening books and watching gardening TV programmes lately to give us ideas and tips. My young friend knows a lot more than I do - especially when it comes to the names of flowers. I'm OK with daisies, roses, bluebells, ivy, fuchsias, etc. but when it comes to those long Latin-type names I'm lost. She's planning a small 'jungle' area and yesterday spent a backbreaking hour or so digging a deep trench to surround the six foot high bamboo she bought. Apparently bamboo grows at a remarkable speed so a 15 inch thick membrane needs to be laid to restrict the lateral growth of the roots. While she did that I gave the top post on her patio a second coat of blue and did a bit of gentle watering. And managed to empty half a large watering can of water all over myself which needed a change of shirt. Maybe I should stick to painting! Talking of which I'm so absorbed with my latest picture that I'm spending about ten hours a day on it. Quite large for a portrait it's bigger than life size and is of a boatman friend of mine wearing a leather jacket. There's a little story to tell about the jacket. A few years ago just after I'd painted Ade Edmonson on the BBC television show "Star Portraits" I mentioned to my friend that I wanted to paint another portrait of Ade, but this time with him wearing something more interesting than the simple tee shirt he was wearing during the programme. I asked my friend to pose and did he have a leather jacket? He assured me he had, but as I became very busy with commissions I eventually abandoned the idea. 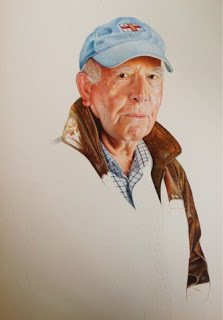 However, after my trip to the National Portrait Gallery in London recently I decided to enter the BP Portrait of the Year competition next spring, and mentioned this to my friend, but this time suggested that I'd like to paint him in his leather jacket. It was only then that he revealed he'd specially bought a jacket for me to paint the first time! Oh dear. I felt quite bad. Still he came to pose the other day and brought the jacket. Here's the progress to date - about 80 hours work. In fact although his black leather jacket was nice it was not as interesting as one I had made (in a day) when I visited Bali about 15 years ago. So this is the one I'm painting. The other day a surprise parcel arrived. It was an autobiography written by an old friend who I hadn't seen for over forty years. When Sir John Madjeski announced that a Thai consortium led by Khunying Sasima Srivikorn has become partners in Reading Football Club I knew that it must be the Sasima I knew from my advertising days, as Sasima is a very unusual name. I hadn't realised that Sir John had given Khunying Sasima a copy of my autobiography 'A Brush With Life' so imagine my surprise when this book came through the post. 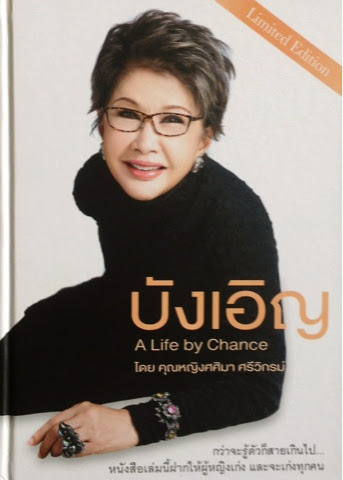 I designed much of the creative work for her when in Bangkok - especially when she owned one of the major international hotels there. All the function rooms - restaurants, nightclubs, and function rooms needed logos. My favourite was the entrance to the Cats Eye nightclub where I had the name constructed in wrought iron with the eye winking and made of jade coloured green glass. Pity I can't find my picture of it. All the girls who worked there wore black silk cat suits and had bright green eye shadow and nail polish. I was very much looking forward to reading her book, but alas, it was written completely in Thai! The Rewind Festival is currently taking place on the banks of the river by Temple Island in Henley. As I was driving over to Bix earlier today to have lunch with friends it was fascinating to see some of the people on their way to the festival. Dressed like Red Indians, Lego pieces, hippies, checkerboards, you name it, they wore incredible outfits. As the festival is all about the eighties music a lot of the people I saw were middle aged - going to see the Boomtown Rats I expect. My sister-in-law Val, together with my neighbour Guy Hart came over for Sunday roast last week. It's so good to see how well Val has recovered from her hip replacement operation. She's walking so much better now and should be back driving very soon. 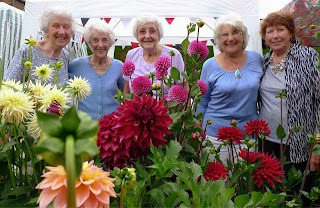 Here she is - second from right together with a bevy of ladies from the Women's Institute. And as she knows so much about gardening my young friend and I have been picking up quite a few tips from her recently. She bought MYF a very nice grapevine which has now been planted right next to the pergola. It already has a couple of bunches of grapes on it. And very nice they are too. I listened to the gardening hour on Radio Berkshire this morning and was reminded to plant bulbs three times their height in the ground for best results. Radio Berkshire rings me from time to time - don't know why, but this week it was for me to talk about influences of teachers at both my primary and grammar schools. The week before they wanted me to give my opinion of Boris Johnson as they knew I'd painted him a couple of times and had appeared with him on Henley's version of 'Have I Got News For You' a while ago when he was mayor of Henley. I remember telling him one time that I was sure he would emulate Sir Winston Churchill and become prime minister one day. Why? Because I noticed as I was drawing him that the furrow above his eyes bore a striking resemblance to the furrow over Churchill's eyes.